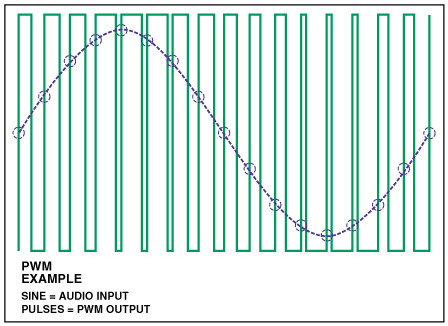 PWM audio (aka Class D) please read "How Class D audio amplifiers work"
A single PWM audio system uses one output pin to create the analog audio signal. You can use a second PWM signal in order to get a higher resolution audio. By selecting the resistor summing ratio (R1 and R2) the second PWM signal will be smaller than the first (representing a series of lower order bits). for a total of 16 bit resolution. Although the PWM distortion and frequency interference is still there, using dual PWM will result in lower noise floor and better/higher working frequencies (with 12 bits single PWM, the microprocessor needs to count up to 4096 (212). By using 2 x 6 bit PWMs, the microprocessor only needs to count to 64 (26) which makes a faster/better signal. Mixing resistors tolerance: For a 1:64 mixing ratio (2 x 6bits PWMs) the resistors must be 1/64 = 1.5% to get the full bit depth. Using 1% resistor is fine. The BCM2835 Libraries are used because they have intuitive and simple commands to control the PWM interface and you can archieve fast GPIO frequecies in standard C programming. 1. First of all start the BCM2835 Library to access GPIO. 3. Set the Clock Divider, usually the higher the clock the better, so the PWM signal stays in the high freqs and far from the audio band. The master clock is always 19.2MHz and the smallest divider is 2 so we have a PWM switching frquency of 19.2/2=9.6MHz. bcm2835_pwm_set_mode(0, 1, 1); //channel 0, markspace mode, PWM enabled. bcm2835_pwm_set_mode(1, 1, 1); //channel 1, markspace mode, PWM enabled. For a good audio signal, the PWM switching frequency should be around the hundreds of KHz region, taking this into consideration together with the resistor tolerance, and ADC resolution (MCP3202 is 12 bits) there is a sweet spot using a dual 2x6bits PWM (12 bits resolution at 150KHz switching frequency with 1% tolerance mixing resistors). note: In the BCM2835 website there is plenty of examples using the PWM libraries. Last Edit: 1 year 10 months ago by ES_Team.